The Eco-Cargo design from Keith Dewey is based on three primary themes: Healthy, Simple, Efficient. Dewey wants the design to inspire residents to live without toxic materials, consume less overall, and use resources wisely. 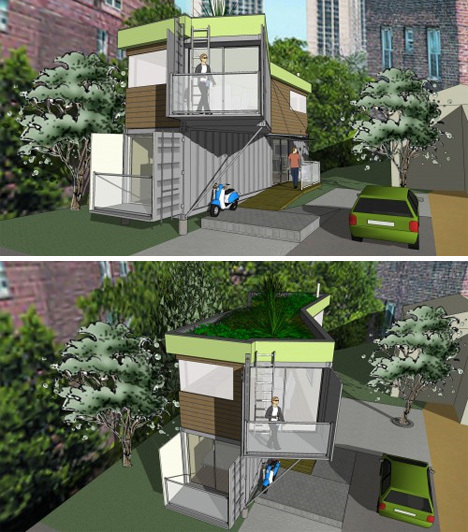 This compact urban home design would allow the home to be inserted into small, otherwise-wasted lots while still providing a decent amount of living space for residents. The staggered design of the two containers allows for increased upper-floor area as well as an interesting visual effect. The Eco-Cargo would do equally well on its own or in a larger community full of similar units.